In “Render Unto Rome: The Secret Life of Money in the Catholic Church,” author Jason Berry exposes the secrecy and deceit that run counter to the values of the Catholic Church. There is no doubt that historically the Catholic Church has been one of the great engines of charity in history. But what happens to tens of millions of dollars turned over to officials at the highest ranks, no questions asked, for their discretionary use? The Vatican has never revealed its true net worth; the controversial Vatican Bank is off the books – a black hole in the annual financial statement. Today the church bears scrutiny by virtue of the vast amounts of money (nearly $2 billion in the United States alone) paid out to victims of clergy abuse. Amid mounting diocesan bankruptcies, bishops have been selling off whole pieces of the infrastructure – churches, schools, commercial properties – while the nephew of one of the Vatican’s most powerful cardinals engaged in a lucrative scheme to profiteer off the enormous downsizing of American church wealth. Before “Render Unto Rome,” no major book has examined the church’s financial underpinnings and practices with such journalistic force. 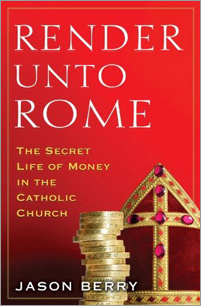 2011 Jason Berry – In “Render Unto Rome: The Secret Life of Money in the Catholic Church,” Jason Berry exposes the secrecy and deceit that run counter to the values of the Catholic Church. There is no doubt that historically the Catholic Church has been one of the great engines of charity in history. But what happens to tens of millions of dollars turned over to officials at the highest ranks, no questions asked, for their discretionary use? The Vatican has never revealed its true net worth; the controversial Vatican Bank is off the books – a black hole in the annual financial statement. Today the church bears scrutiny by virtue of the vast amounts of money (nearly $2 billion in the United States alone) paid out to victims of clergy abuse. Amid mounting diocesan bankruptcies, bishops have been selling off whole pieces of the infrastructure – churches, schools, commercial properties – while the nephew of one of the Vatican’s most powerful cardinals engaged in a lucrative scheme to profiteer off the enormous downsizing of American church wealth. Before “Render Unto Rome,” no major book has examined the church’s financial underpinnings and practices with such journalistic force.